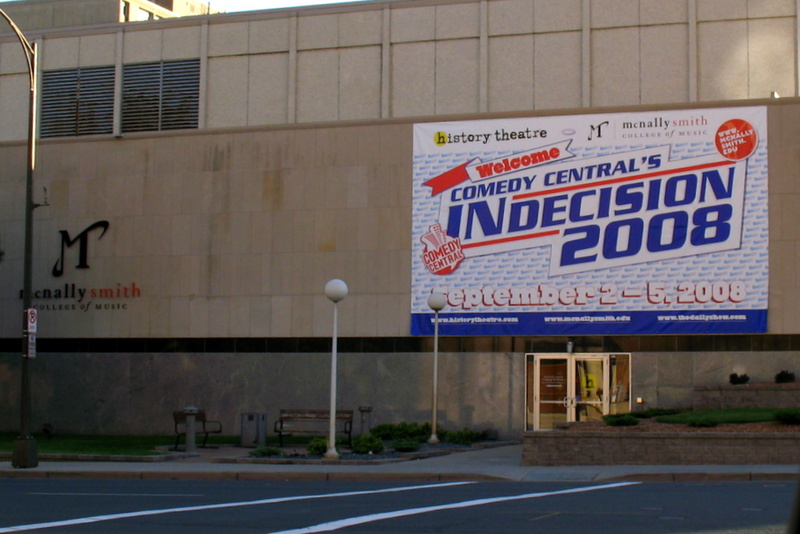 On Friday when I was driving around looking for RNC protesters, which I only found one person [see yesterday's post], I stumbled upon this banner hanging promoting Comedy Central's Indecision 2008 television program. What's strange is, I had no idea they were coming to town to broadcast here in downtown St Paul at the History Theatre. My only question is, where they in Denver during the DNC? And there he was, protest sign and all, about a block away from the Xcel Energy Center where the Republicans will host the Republican National Convention September 1-4, my first protester sighting of the RNC. 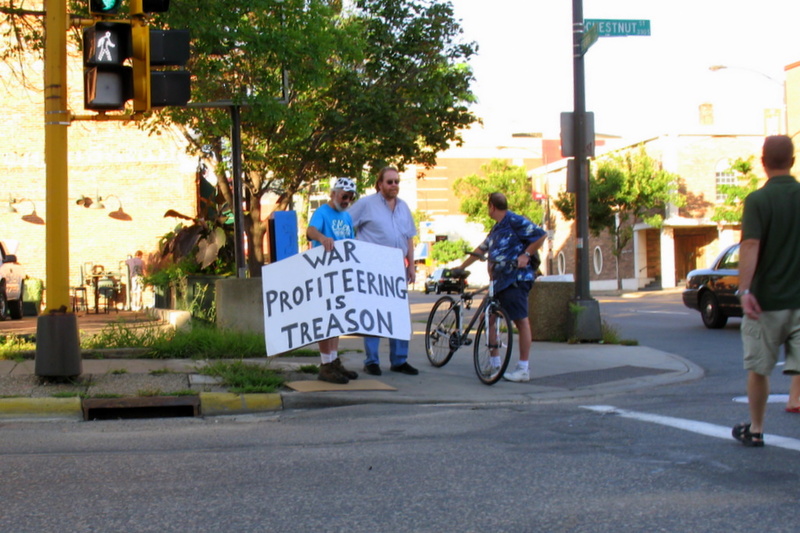 While I am not a protester of any kind, nor am I promoting any protest group, I am only posting photos as it relates to the Twin Cities and what's going on around town. The stir in town is huge. 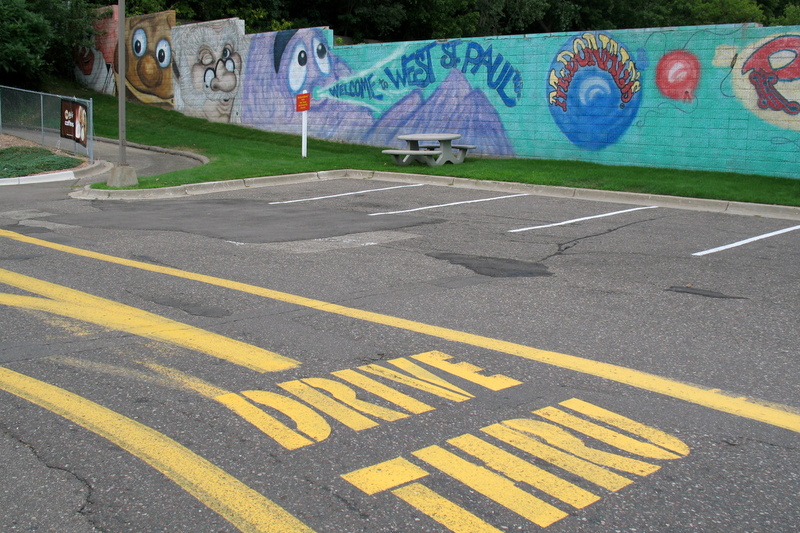 Traffic into and around the Xcel Energy Center has been severely altered until 6:00 AM, Sept 5. Monday in St Paul, there is going to be a protest march were they are expecting 50,000 people. This is unbelievable to me. Mind you, I will not be protesting, I only want photos for this daily photo site. But my thoughts are....where are all of these people going to be staying for the next week or so? Those are the protesters, 50,000 people, we not even counting the real reason for next week when the Republican National Convention gets underway. How many people will be involved with just that? What an economic boom for the Twin Cities areas. So keep in mind, tropical storm Gustav [as of 11:00 PM Thursday] and currently located over Jamaica [hang in there Jamaica] could make landfall sometime during next weeks RNC. So there is talk of delaying the convention a couple of days to make sure we have everything in order where ever the potential hurricane makes landfall. What does that do to all of these protesters plans? 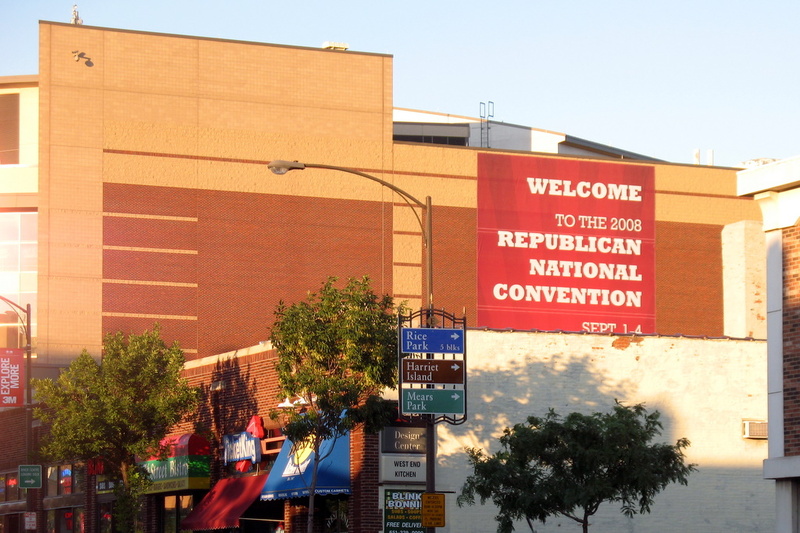 I would imagine many are flying into the Twin Cities just for the RNC and have a schedule time to leave, but if the convention is delayed, will the protesters just go away? 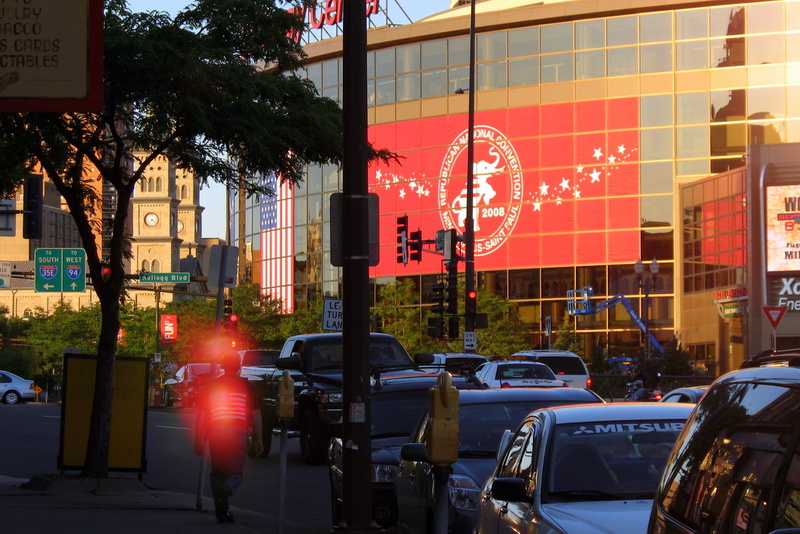 The big news in the Twin Cities happens next week from September 1-4 when the Republican National Convention moves into the Xcel Energy Center. Right now, the Democrats are having their turn in Denver. I've been following the protests outside of the convention in Denver mainly. I do plan on taking photos during the RNC, but I'm starting to worry about being around the negative environment. It's a rare photo event and I'm finding myself losing confidence in getting out there. this is all worst case scenario kind of stuff, but it's better to be prepared. So do I still go? Do I need to worry? 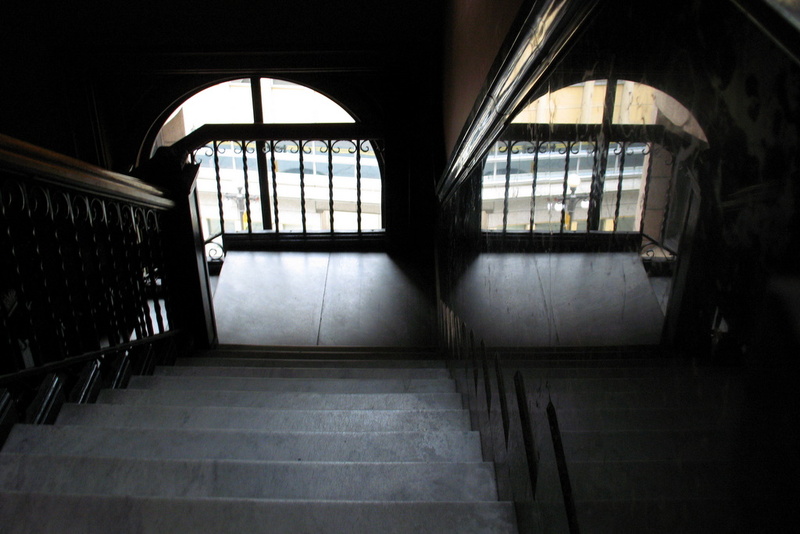 I was walking on the second or third floor of the Landmark Center in downtown St Paul when I passed this stairwell. It was an unexpected location for a reflection photo. The building on the right is The Saint Paul Hotel. Most photos you'll find of this great historic hotel are from the other side from where I am standing and the main lobby. It's quite the view from the other side as I've posted it here a couple of times on the Twin Cities Daily Photo. Today I'm on the East side of the building, and what has me puzzled is the two balcony's on what looks like the 5th floor. Why are they there and why are there only two of them? Was there more at one time in the buildings past? 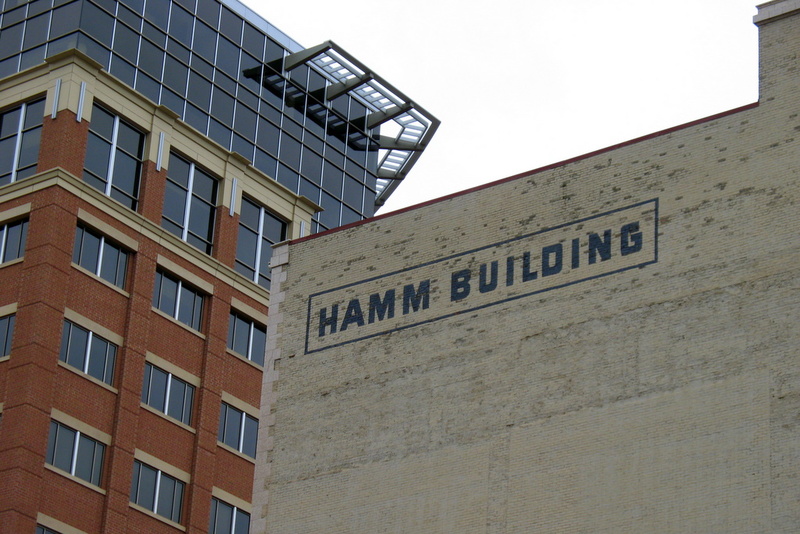 The historic Hamm Building meets the newly built Lawson building. Quite the different styles in building. While each is unique, which style do you prefer? Looking up in the East spiral staircase at the Landmark Center. The immense, castle-like structure with two massive towers and a fanciful array of small towers, windows, and dormers became an immediate landmark. It had taken ten years to complete, covered an entire city block, cost more than $2.5 million dollars, and at the time of its completion was the largest building in the city. 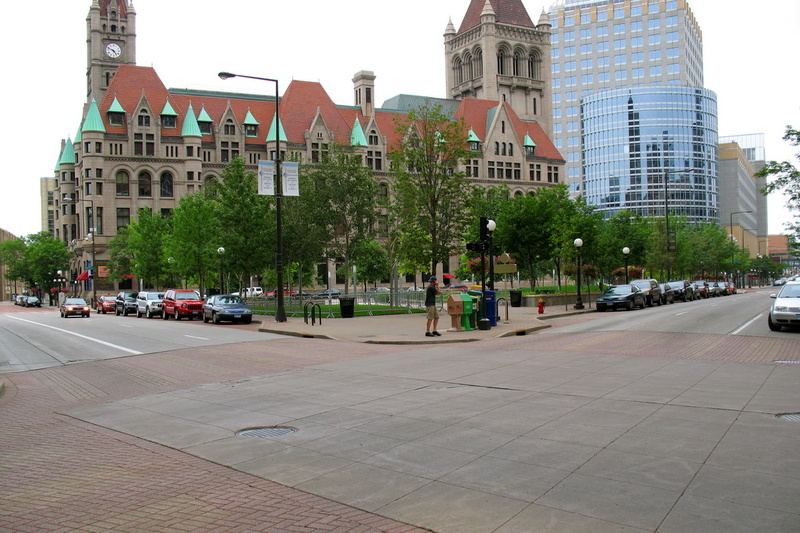 The exterior design incorporated two contemporary styles, Richardsonian Romanesque and Chatequesque, executed in St. Cloud pink granite. Continuing on from yesterday's photo. I mentioned congress approved funding for a new Federal Building in 1891. Actually there were 33 Federal Buildings that were approved funding throughout the country. 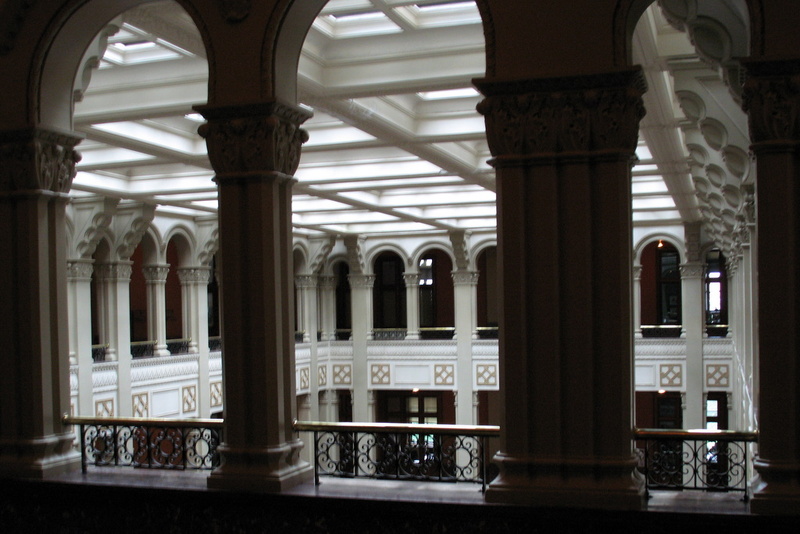 All 33 buildings authorized were designed in the office of the Supervisory Architect of the Treasury Department. Although the Supervisory Architect signed all plans, the designs were actually collaborations among the more than 500 employees in his office; architects, engineers, draftsmen, specification writers, and cost estimators. Architects in private practice caled the office a "plan factory," referring to its practice of cranking out the design piecmeal and only a step ahead of the construction process. 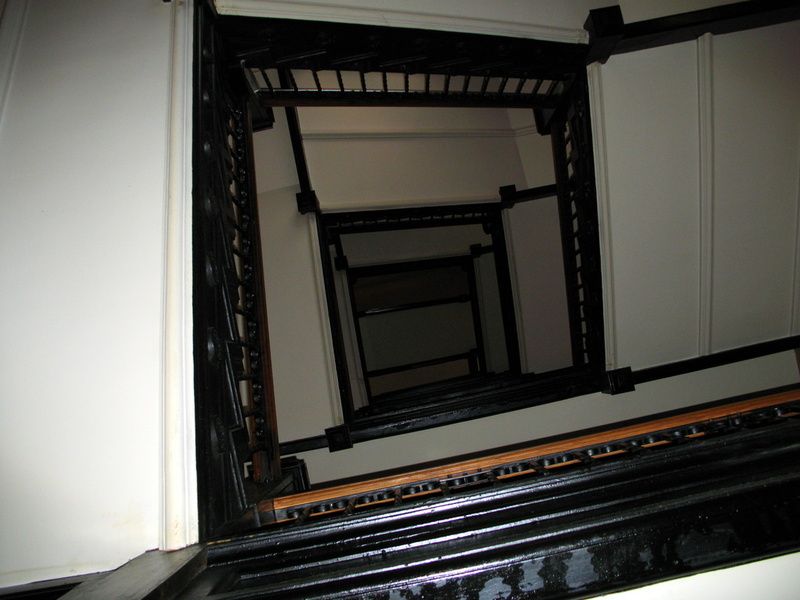 Others criticized the office for the standardized appearance and floor plans of the 33 buildings. 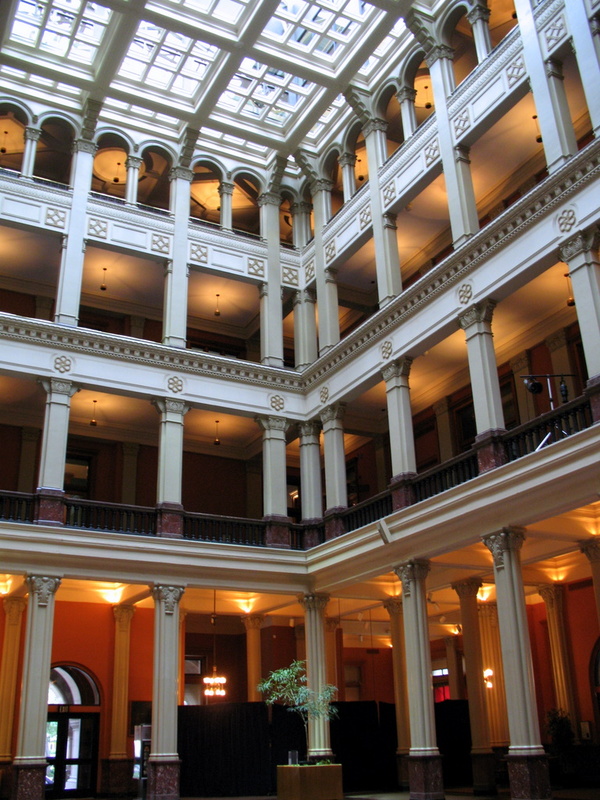 Judging by the photos I've seen of some of the Federal Buildings, many of you have a building similar to the St Paul building, which is now known as 'Landmark Center'. 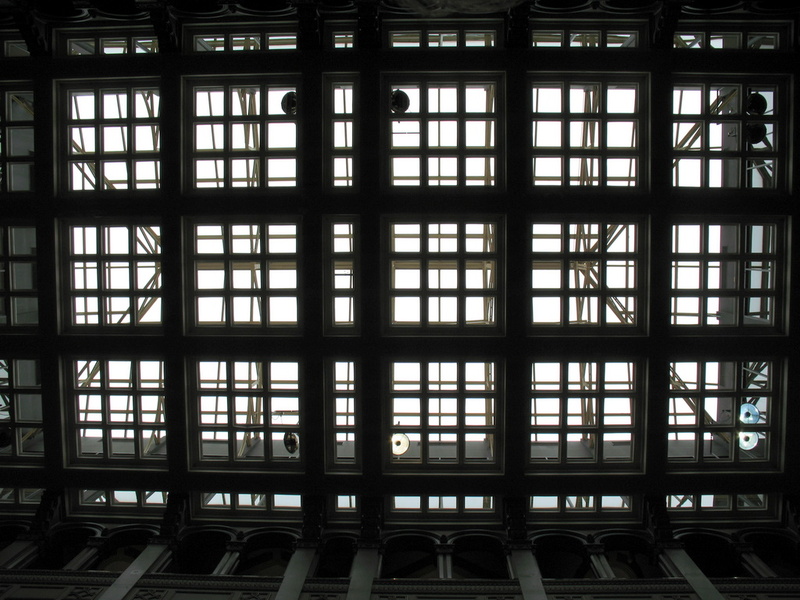 The last couple of days, I've been teasing you with ceiling photos of the Landmark Center in downtown St Paul. It has been 20 years since I had last set foot inside the building, but I do recall learning that the building originally was built without electricity and used natural light for the occupants to see what they were doing. By the late 1880's Minnesota's capital, St Paul and it's sister town across the river, Minneapolis had grown into thriving young cities. Only 40 years earlier, when St Paul was little more than a small collection of houses and muddy streets, Henry Jackson had dispensed the city's mail from a shelf in his dry goods store. Now St Paul was receiving more than 50 million pieces of mail annually, and the post office and federal courts had outgrown their space in the city's original federal building at Fifth and Wabasha streets. Civic leaders and elected officials began lobbying Congress for a much larger federal building. After several uncuccessful attempts, the St Paul contingent succeeded in 1891 when Congress approved a grand new building, one that would confirm St Paul's rapid rise and promising future. As I am quite tired from a day of traveling, I'm leaving you with a different view of yesterday's ceiling for you to guess where I am at. 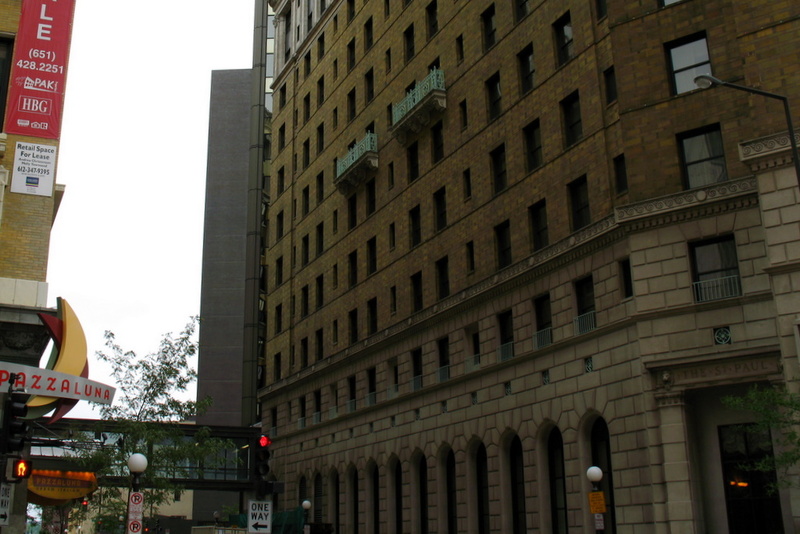 While it is a tad out of focus, the outside of this St Paul building has been featured here on the Twin Cities Daily Photo on a number of occasions. A photo for the locals, can you guess where I am located for this ceiling shot? This one is probably too easy. Yesterday I mentioned there was no seating beyond the home run fence in Midway Stadium. I'm sure your wondering what is beyond the home run fence if there are no seats. Wonder no longer, there ain't much to see over the advertisements but trees, buildings and blue sky. Can you believe it rained shortly after taking this photo? Jim of Terrel Daily Photo mentioned in his comment from my August 14 photo that my seats looked pretty decent. While this is very true, I thought I would show a photo that was panned back a bit to show more of the stadium. 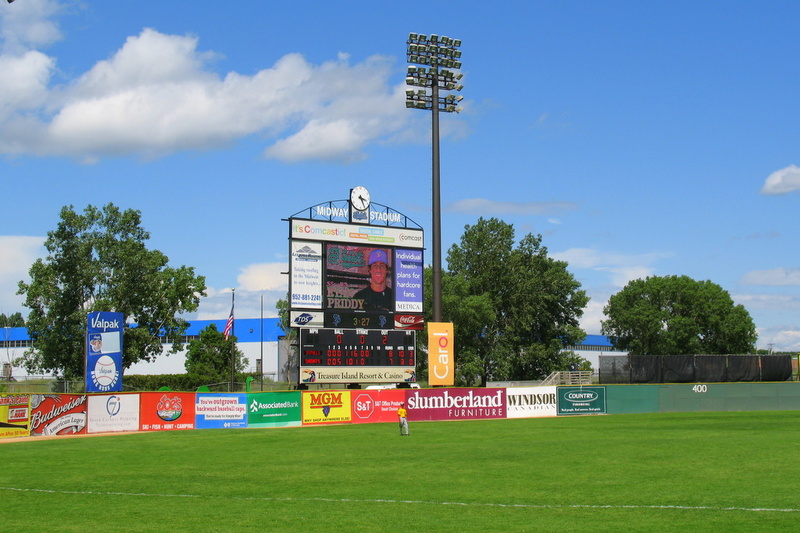 Midway Stadium in St Paul, home of the Saint Paul Saints is quite small in size. Not sure how many it holds, but there is no seating beyond the home run fence. The outfield seats are very limited and generally all of the seats sport a great view. If you look across the field and can figure out where the pitchers yellow hat is, that is a comparable area from where I am sitting taking this photo. 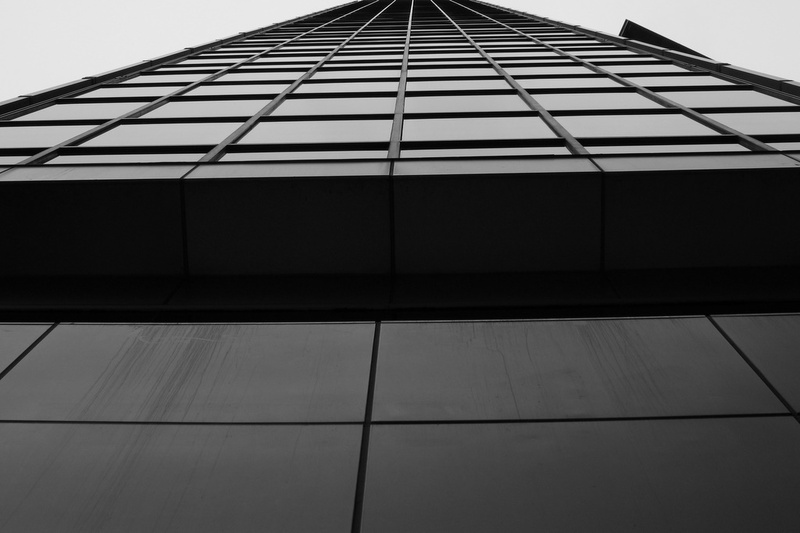 This is a contribution photo by Eric of the Foshay Tower in downtown Minneapolis. The Foshay Tower was built in 1929, modeled after the Washington Monument and stands 447 feet tall, plus an antenna that extends the structure to 607 feet total. It has been credited as the first skyscraper west of the Mississippi. It remains the second tallest concrete skyscraper with the Empire State Building in New York as the tallest. Normally the lights on the Foshay Tower go unlit. I believe I heard it had been 15 years since they were last lit up. 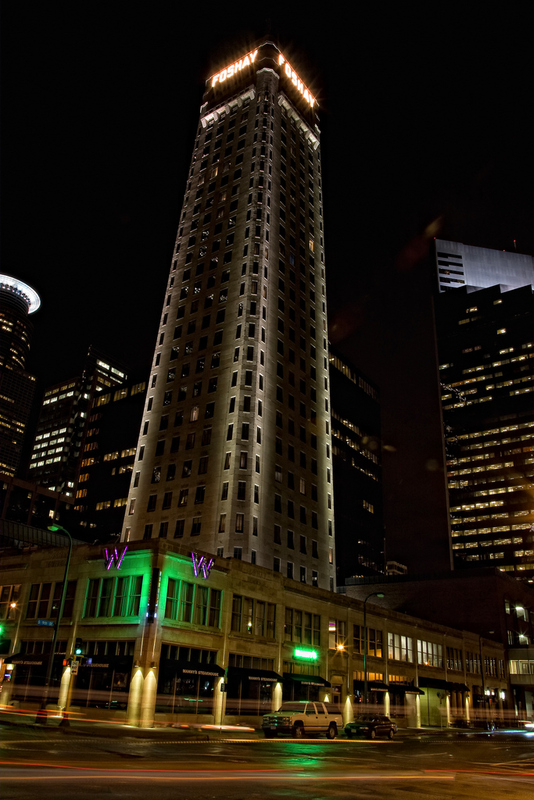 The reason they were powered on was to mark the opening of a new beginning for the Foshay Tower. It has been converted from an office building to a 230 room 'W Hotel'. 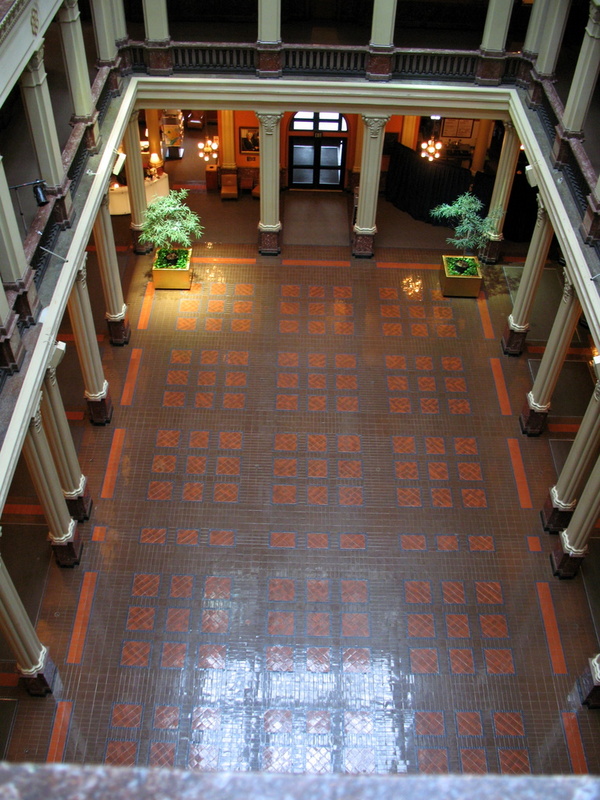 Ralph W Burnet and Ryan Companies have spent over $90 million in the renovation process. This great contribution photo and more can be found found at the authors flicker website. 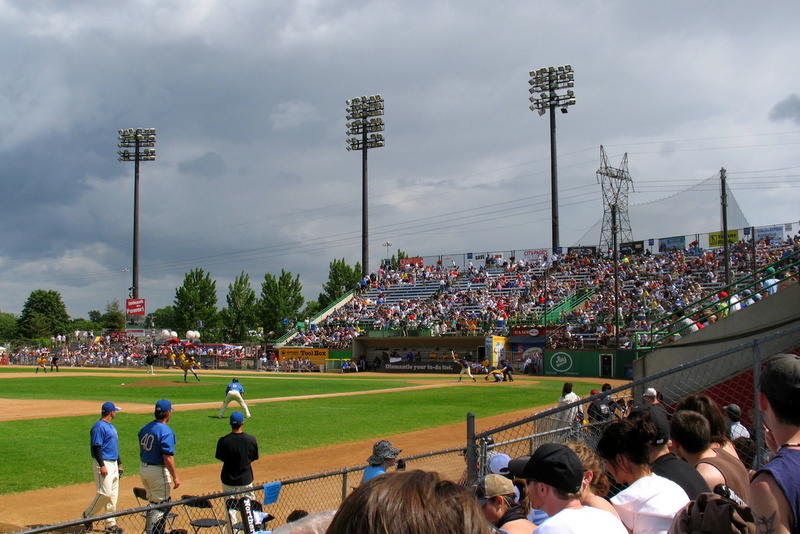 The Saint Paul Saints are currently the only professional baseball team in Minnesota that plays outdoors. This has been the main attraction for this American Association of Independent Professional Baseball teams. 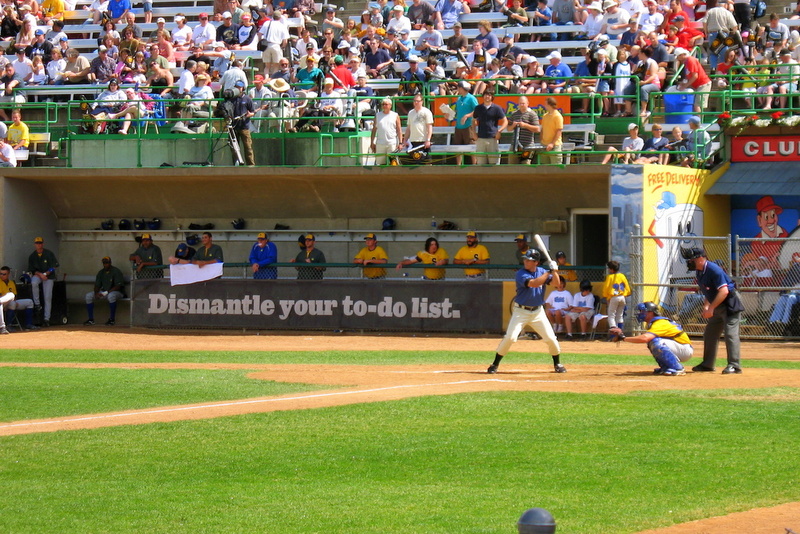 Starting in 2010, the Minnesota Twins will open an outdoor baseball stadium. The Saints have been a team in the Twin Cities for 10 plus years and this summer, I finally went to my first outdoor ball game. Despite the sunny weather in the photo, it rained shortly after taking this photo. Haha! Something to look forward to once the Twins start their play in their outdoor stadium. 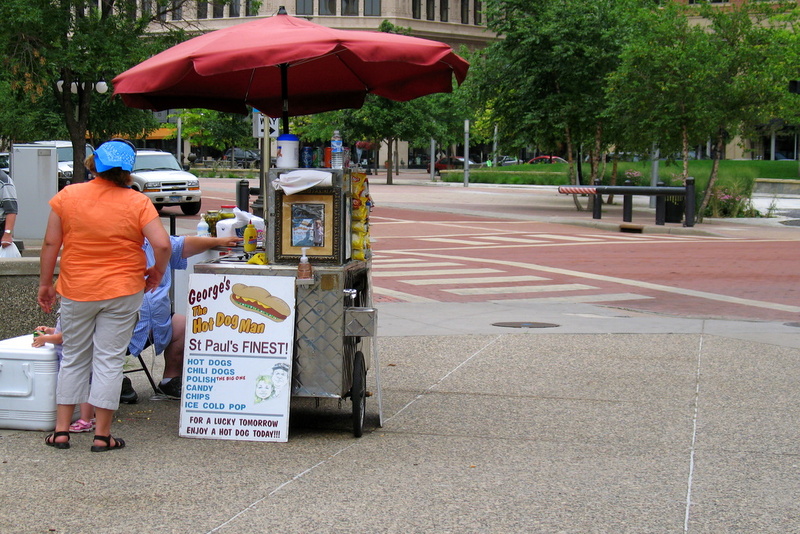 "For a lucky today, enjoy a hot dog today" so says the slogan at George's The Hot Dog Man stand in Rice Park, downtown St Paul. I made a quick stop at the McDonalds in West St Paul, a place I used to visit when I was younger. 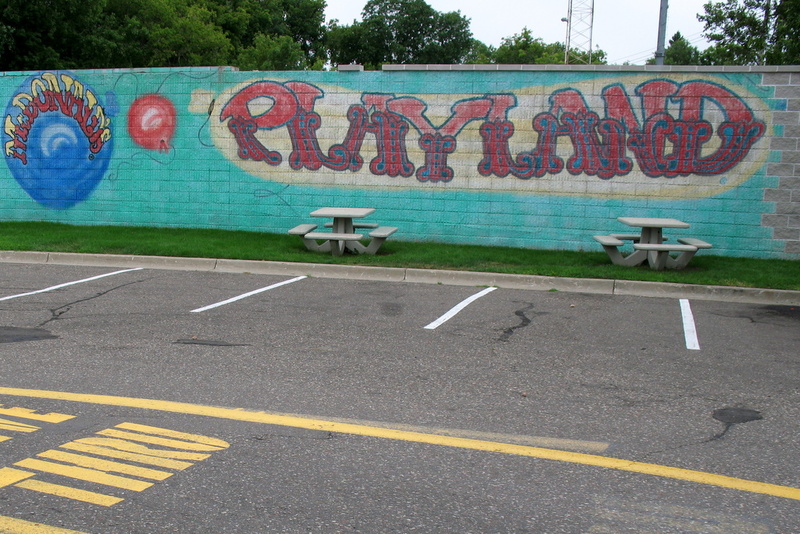 Often my mom and dad would take me to the playland here. It was just a simple playground with McDonalds characters as parts of the rides. The best part of it was the tram that would take you from the bottom of the hill to the top of the hill where the playground was located. Looking back at what they used to do for the kids was amazing. No one today would ever do anything like this at a fast food restaurant. All that remains in the path up the hill, which is located near the current drive through road, plus the artwork on the cement wall. 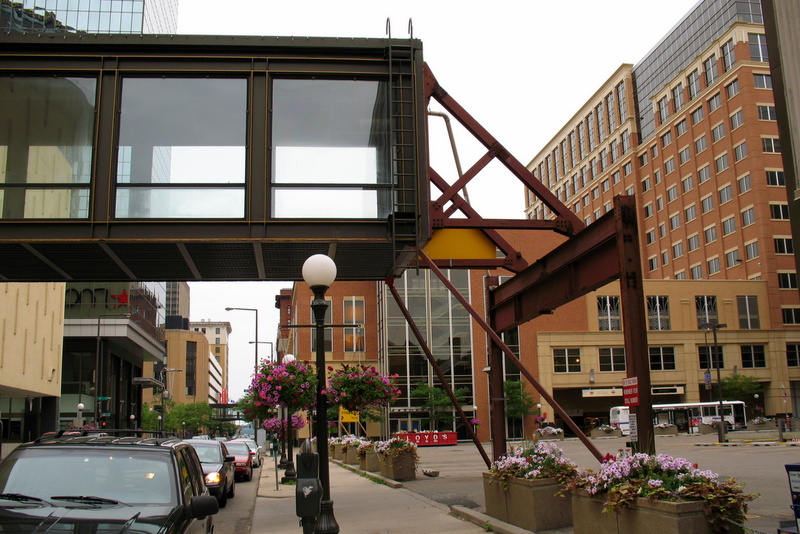 I'm sure you're wondering, what happens when you reach the end of the skyway system in downtown St Paul? Well, now you know. Looking down the alley on a downtown St Paul road. I believe I was on Sixth Street with St Peter as the cross street I just passed. Standing back just a bit to see more of the fountain. 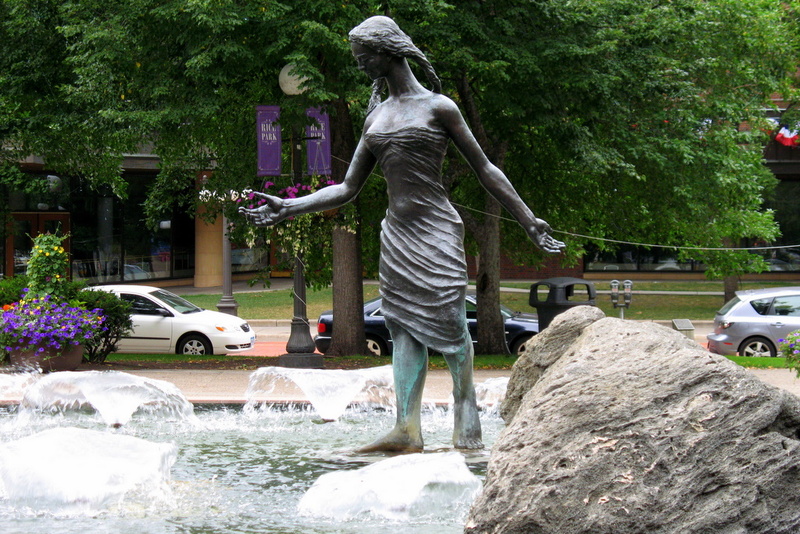 I've posted a few photos of this statue in Rice Park, downtown St Paul, but until today, I'd never posted one taken during the summer months when the water is flowing. 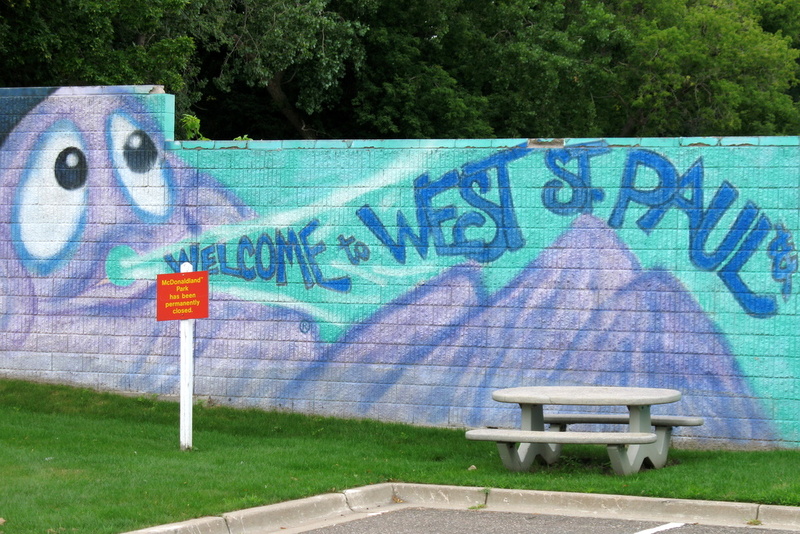 Those of you familiar with West St Paul, may recall the Signal Car Wash during it's prime just off of Robert Street, behind the old Signal Hills Shopping Center. I believe it is closed now as it was a Sunday around 2:00 at the time of this photo. It would have been open during it's business hours. 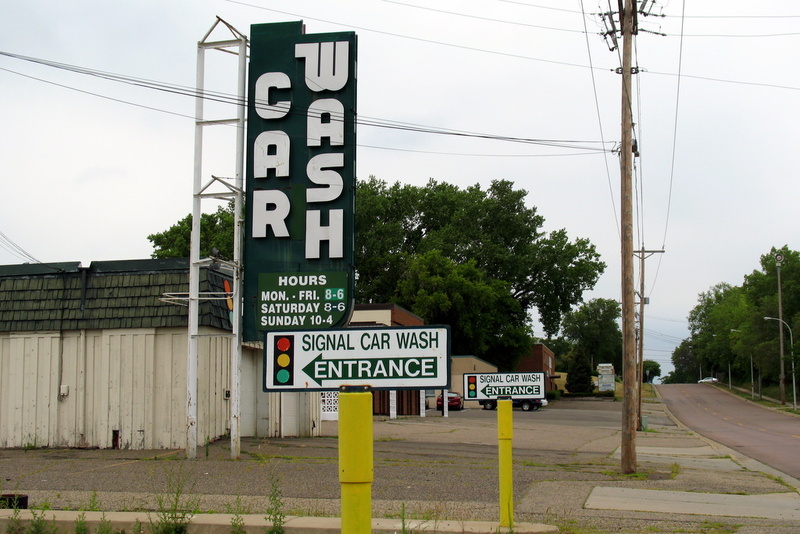 I do recall visiting the car wash when I was much younger. It's the automated type of wash. Drive your car in and watch it travel down the track in various stages of wash and rinse. The customer would stand behind glass windows and watch as the vehicle progressed to the finish line. Looking up on the Yorktown building in downtown St Paul. This neat build was rather fun to take photos of. 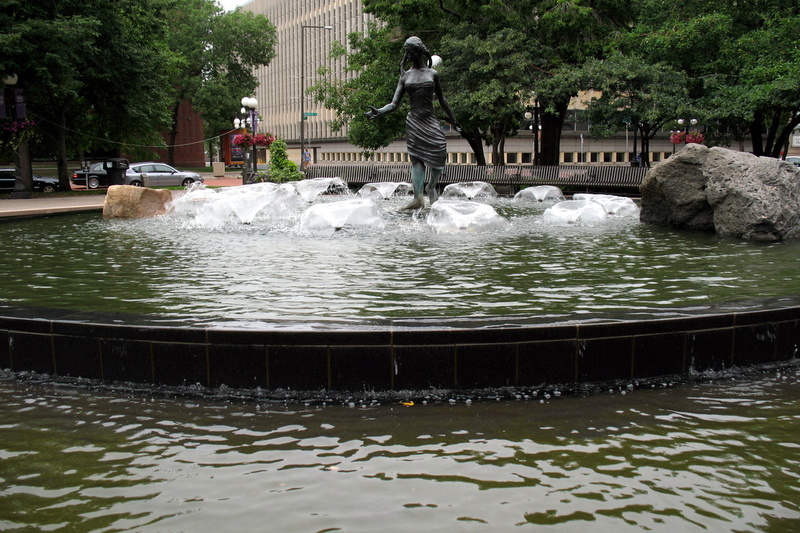 It's located in downtown St Paul just off of St Peter Street, behind the Landmark Center. 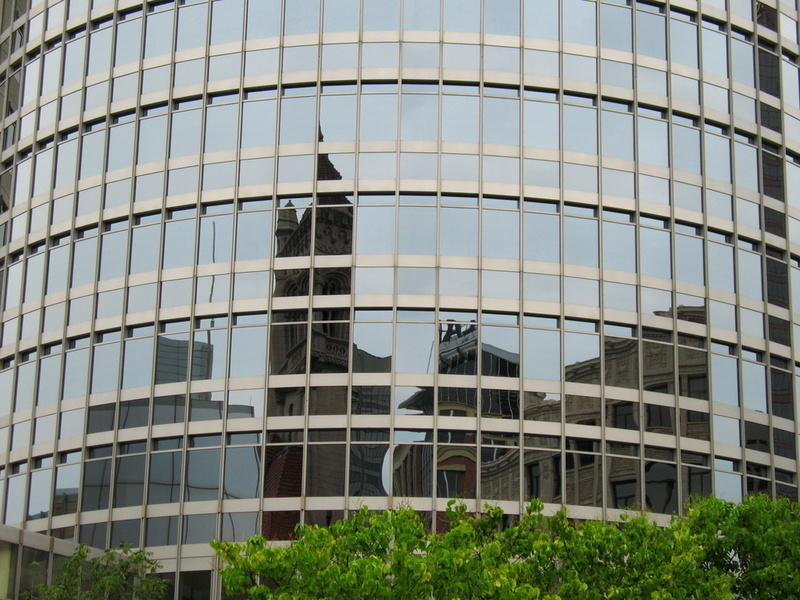 You can see some of the reflection of the Landmark Center in the glass. 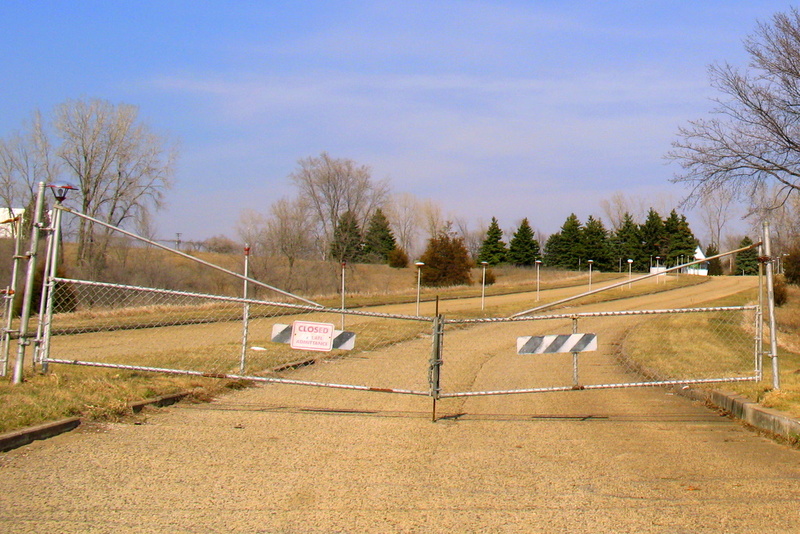 This is the metal fence entrance to the Cottage View Drive-In. It's obviously closed during the day time hours. Perhaps this is the final season for the drive in, only time will tell. Hopefully I have a bit of a different take on the August Theme Day. 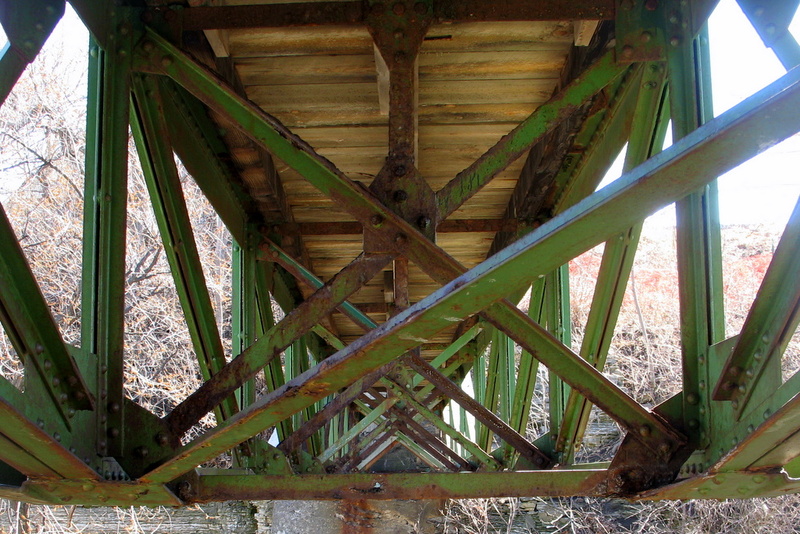 This month the them is 'metal' sure, sure, Minnesota is home of the Iron Range in the northern part of the state. My take on the 'metal' theme is the 'Heavy Metal' variety. I enjoy a good, loud, head banging, fist pumping, mosh pit, thrashing guitars, pounding drums, guitar solos and a singer who doesn't sound like Britney Spears. 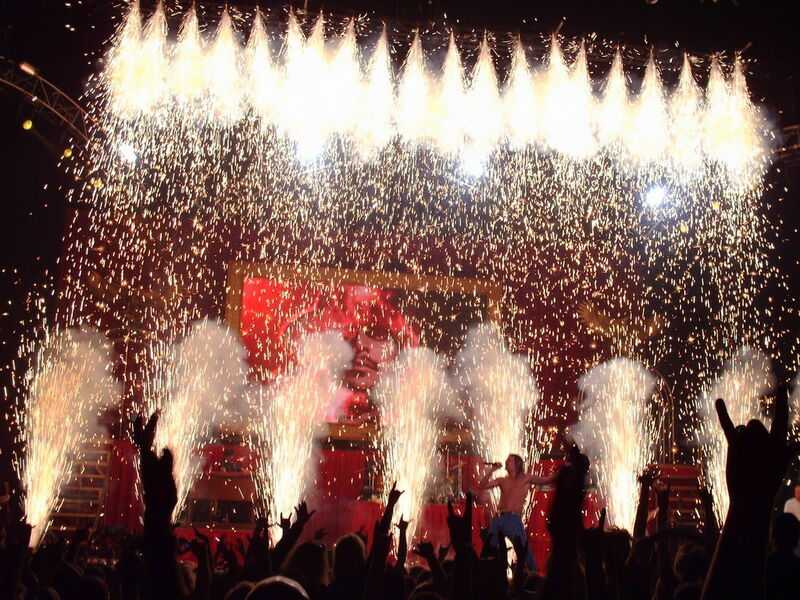 From row 14 at the Kid Rock concert at the Xcel Energy Center on April 13, 2006. This is my 'metal' theme day photo. Oh and I may not exactly enjoy the mosh pits, I'm not as young as I once was. Stop by the other cities participating in the August Theme Day via the links below the photo. Do remember that there are timezone differences between the other cities. Or you can head over to the portal page to see a thumbnail view of blogs that have posted their corner store photo.